Just the thing I've been looking for. Thanks! What an awesome post! Thank you for sharing these tutorials. A great use of fabrics that you may love, but just don't know what to do with! too cool for school! Thanks. great!!!! thank you so much. Just be sure you all use Jess's fabrics when you make them! Perfect! Thanks for compiling all these links! I am SO SO excited about these. You have no idea. Thanks for sharing. Thank you! I just started a hand-piecing project (something to do while watching TV), and thought, "Gee, I could use some fabric bins to keep all these bits and pieces from taking over the coffee table; I wonder if I saved that tutorial I saw online a while back..."
PERFECT solutions, with perfect timing! 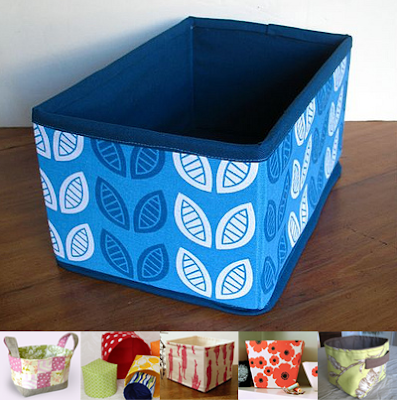 I love those storage bins…guess I have no excuse to try and make one now! Thanks for sharing. Indeed I do love it. Thanks! Just what I need! You are great at finding good stuff! I keep bookmarking your awesome tutorials for the day when I can do them. Thank you for sharing. Thanks for collecting these in one place. I've made about 40 of the pink penguin style only with solid sides instead of patchwork, saves about 30 minutes a basket. Great post. Thanks for all the great links. I've always wanted to know how to make a cuter storage box. Bookmarking--I always need storage bins! Thanks! Just got my first sewing machine, I'd love to try some of these! This is so cool! The basket is lovely. The fabric prints are making the project so beautiful. Wow! It’s adorable. This project is so creative. I love it. Really very nice i like it thanks for share it. Very nice tutorial. I found this to be useful. Thanks for sharing your idea. Good Stuff i love it thanks for sharing. Now try--it seems to have moved, but I updated it. wow! so simple yet it rocks! Really love theseand I will try to do one in the future since I am organasing my sewing room. These are very useful. Thanks for the tutorial. Such a lovely idea for storage baskets, thanks for sharing.